I made Asian style noodles in the crockpot recently, and we all loved them. Sometimes crockpot food tastes a little washed out, but this meal had loads of flavor, and we had plenty of leftovers for the next day. In large bowl, combine first 9 ingredients. Place beef and mushrooms in crockpot and pour the sauce over to coat. Cover, cook on low for 5 hours. Cook pasta according to directions. Steam broccoli and edamame lightly. 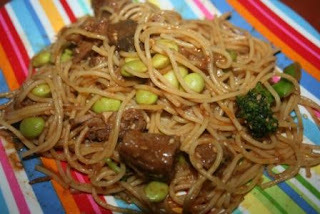 Toss pasta and veggies with cooked crockpot sauce, sprinkle with sesame seeds. We have just discovered edamame. This would be great for us to have for dinner. that looks really really delish lisa! i'm not sure we have an asian market in our town...hmmm....will have to ask my friends! I love a new crockpot recipe! That sounds delicious!!! This looks great. We love Asian dishes and I am always looking for something different in the crockpot--definitely adding this to my list. That looks awesome! It seems like we only ever have time for crockpot meals or carry-out! I am SO lame. There are so many ingredients I swear I'd mess it up. It sounds yum, tho!